You no longer have to assemble the small “tricky” connector yourself. The ingress protection of molded cables is usually higher. The cable is already included in the total low-cost price. 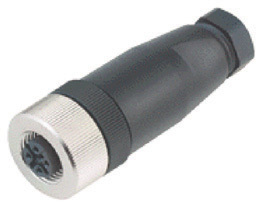 However, if you are uncertain in your selection of the suitable M12 x 1 mating connector (as there is a relatively large number of versions: straight/angular, 4-pin/5-pin, etc…. ), it would be best to contact us. There you will be given advice, and a solution tailored to your needs will be recommended.